Gift-giving occasions happen all the time! From birthdays to baby showers you can always find the perfect gift at JCPenney. Discover thoughtful tokens of appreciation and meaningful gifts for every member of your family. We can help you find a suitable gift for every party or event so don't worry about it, we have something for everyone. Mother's Day is right around the corner, and JCPenney has a wide selection of Mother's Day gifts for all the mothers out there! 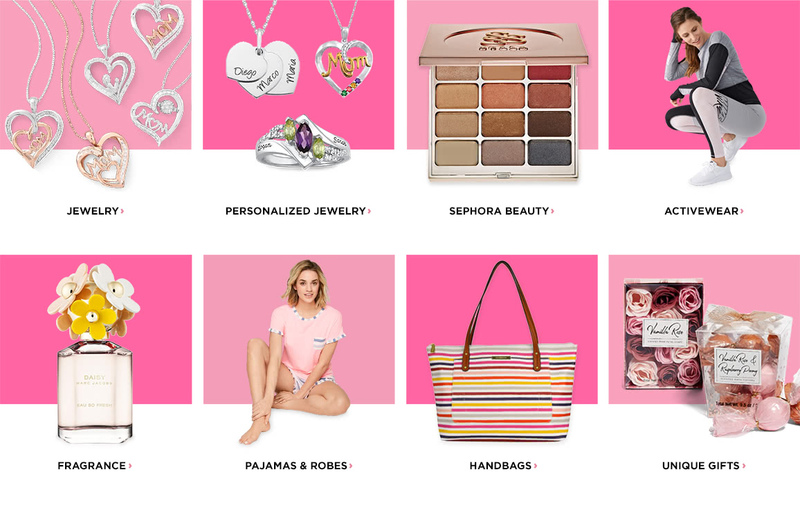 From just for mom gifts like jewelry and activewear, to mommy and me gift combos like dresses and pajamas, you're sure to find the best selection of gifts for yourself or for your own mother. But if you're having trouble deciding exactly what to get, a JCPenney gift card is a great mother's day gift in and of itself! Join the tech revolution and give a smart gift! A Fitbit activity tracker will suit the health enthusiast in your life with options to sync with smartphones as well as coming with stylish interchangeable wristbands. A smartwatch makes a useful present for someone graduating or just starting out in a career. Smart home systems are popping up everywhere so give a voice-activated home assistant or connected home monitoring system with doorbell camera to make great housewarming gifts from you and JCPenney. Kids will tell you that most of the fun things happen outdoors so give them some extra fun in the sunshine. Trampolines are a fun way to keeps kids busy and active as well as providing a way for adults to meet their own fitness goals. Many childhood dreams center around getting a new bike so make that dream come from true for a young or young-at-heart person in your life. Don't forget the helmet and bike lock! If two wheels aren't enough, take a look at the inline skates and skateboards which still score high points on the coolness scale. JCPenney has everything to give the gift of enjoying the great outdoors. Give the gift of staying in with JCPenney's home theatre and surround sound systems. Give a home stereo for those impromptu kitchen dancing nights or simply add to someone's music collection. Dad will appreciate the crystal-clear sound of his favorite tunes on Father's Day. Check out the colorful headphones for kids or remote-controlled cars which are sure to be a favorite. Nothing says "I love you" quite like sparkling jewelry. Find a statement piece or browse our collection of fine jewelry made with gold, silver, and colorful gemstones. Personalized pendants or rings made in custom styles with birthstones to match the family make unique and thoughtful gifts for Mother's Day or anniversaries. Choose a lovely gift from our selection of earrings to fit any budget or a classic jewelry box to keep them in. JCPenney has a watch for everyone including fun kids' watches in analog or digital featuring favorite characters. Check out our collection of gift sets built around themes of relaxation and style. Makeup bags, clutches, pretty travel mugs, and phone charging accessories are sure to be appreciated gifts for any woman on your list. Find fun electronic handheld games, barbecue tools, and outdoor lounge chairs for Father's Day or even just to celebrate springtime. No matter who you are looking to buy for, JCPenney has a gift that will be just right!